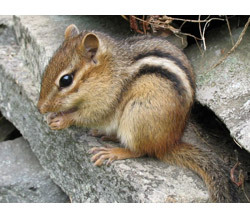 Colors: Depending on species, chipmunks can be gray to reddish-brown in color with contrasting dark and light stripes on the sides of their face and across their back and tail. Chipmunk is the common name for any small squirrel-like rodent species of the genus Tamias in the family Sciuridae. About 23 species fall under this title, with one species in northeastern Asia, one in the eastern portions of Canada and the US, and the rest native to the western part of North America. They range in size from the least chipmunk, which, at 18.5 to 21.6 cm and 32 to 50 grams, is the smallest chipmunk, to the Eastern chipmunk, which grows up to 28 cm and weighs as much as 125 grams. Chipmunks can become very tame if you have enough time to spend with the animal. They love to be handled and they like attention. Pet owners that have chipmunks usually have to handle them by their tails. You need to be very careful with handling a chipmunk by it's tail because they can break off. 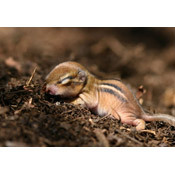 Most chipmunks that are kept as pets will not live longer than six years old. 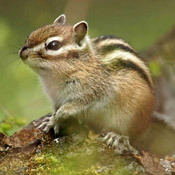 Chipmunks that don't have their own area to retreat to will probably not live longer than a couple years in captivity. Chipmunks also need something that they can chew on. Without something to chew on, their teeth will grow very large and grow through their jaws or they will become so uncomfortable they will completely stop eating. Make sure to purchase some type of chew blocks for your chipmunk to chew on. The females come on heat twice a year, spring and autumn. The timing is quite varied, as this year some of my females came on heat as early as January and some are still trying to attract a mate now (it's the middle of April as I write this). One of my girls started chirping for a male for the filth time this year. The females advertise their readiness to mate by continuous chirping for the whole day. Although they must also emit pheromones, as the males will know about it even before the female starts to chirp. If your chipmunks are kept outdoors you should find they start later in the year, depending on the weather, from about March onwards.